The world is full of tales of broken families so steeped in their problems that they couldn’t take care of their kids. Every generation needs a hero. Not a man (or woman) who will wear a crazy costume and have strange powers - the stranger the more potent. Not an android that will save the world and its uncle. Every generation needs an achiever it can connect with. A flesh and blood person who rises against monumental challenges. Rises like air.GenX Now has found its inspiration. Simone Biles. With five gold medals, the American artistic gymnast is the 2016 Rio Olympics' individual all-around champion. In a world torn by strife and disharmony, she is also the embodiment of some of the best social values that America boasts of - the love and care that nurtures a child despite challenges. The world is full of stories of broken families and parents so steeped in their problems that they couldn't take care of their kids. Shannon Biles was one such mother, wrecked by alcohol and drug addiction. She was mother to four children. A girl seven years older than Simone, a boy five years older, and the youngest Adria, two years younger. Today, the curriculum vitae of Simone Biles will stump the most ingenious Hollywood scriptwriter. Biles and her siblings were eventually placed in foster care. The children were shuffled back and forth between their mother's house and a foster home. This went on till Simone was about six years old. One of Simone's earliest memories was being at a foster home that had a trampoline. She and her siblings weren't allowed to play on it though. The story of Simone may have been sadder, and much different, if she was not raised in the love and care of her aged grandparents. It is remarkable that the child held back from the trampoline is today the global queen of the vault, the balance beam, the floor exercises and uneven bars. In 2001, Simone and her younger sister Adria were adopted by their grandfather and step-grandmother, Ron and Nellie Biles. For Simone, the road to Rio began with a daycare field trip. This was a casual, fun trip to a local gym. The girl who has wowed Rio and the whole world with her moves never left home to practise with an exclusive, elite coach. It is remarkable that she has become the individual all-around champion in the Olympics training with her childhood coach. Aimee Boorman started training Simone when she herself was only a teenager, and Simone was seven years old. At the haloed contest complexes of Rio, it was Aimee who stood as Simone's coach. Simone stayed with coach Aimee from Houston to Rio. As a member of the national team, Biles attended the mandatory training camps every month in Huntsville, Texas. This is where she first met US national team coordinator Martha Karolyi. Karolyi, the 73-year-old national team coordinator for gymnasts, was among those who watched the star in the making. As a child, Karolyi found Simone's "bounciness was really out of control". Karolyi wasn't sure if the team trainers "would be able to make this little girl to focus and be very disciplined". Much to their delight, the little champion gymnast stayed on track. Simone is all of four-feet-eight. At a junior national team camp, Karolyi said Simone was "a little bit silly". Once participation in the training camps was done, the gymnasts were on their own with their personal coaches. Nurtured by Boorman, Simone blossomed. From a teenager coaching the little girl to a mother of three now, Boorman took a low-key approach to training. This was rare for a sport as competitive as gymnastics. 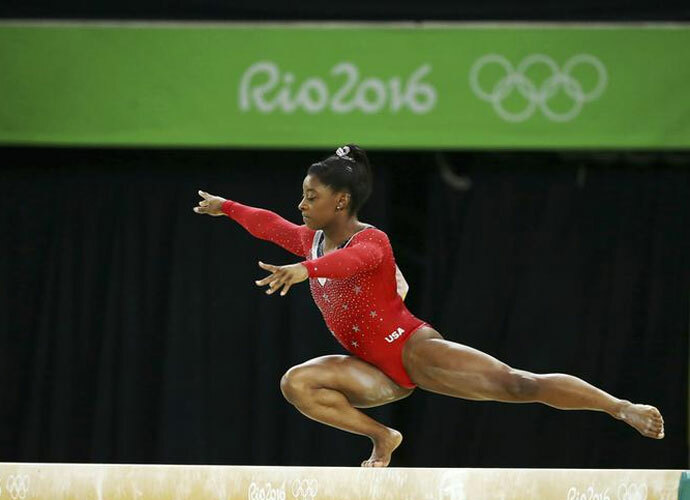 For Biles, swinging on the uneven bars was a major challenge. Also, she kept falling off the balance beam. Boorman kept the going easy for her. She told her that as a gymnast, Simone could be content being the college champion. Simone was not the one to give up. She insisted on practising more and more. "I want to do this" was her refrain. Boorman's mellow route to perfection proved to be a huge blessing for Simone. A hugely intensive, overwhelming approach can burn out a gymnast at an early age. Boorman was a coach who believed in taking time off, and in family vacations. She protected Simone from overextension. Today, the curriculum vitae of Simone will stump the most ingenious Hollywood scriptwriter. Simone is the first female gymnast to win five gold medals at a single sporting event - the Rio Olympics. She is also three-time world all-around champion (2013-'15), three-time world floor champion (2013-'15), two-time world balance beam champion (2014, 2015), four-time United States national all-around champion (2013-'16). She is also the first woman to win three consecutive world all-around titles. She is the most decorated American female gymnast in World Championships history. The life of this young woman brings to us a single, most important message. Nurtured amidst love and care, a child can - and does - reach for the stars. And find them.